Players will need a reputation of Revered or higher with The Wardens before being able to purchase this pet. Max level players can complete World Quests and complete The Wardens Emissary objectives to earn larger chunks of reputation. Against Bodhi Sunwayver, this pet can be devastating. This Owl can easily solo all three of his pets. Hit his aquatic pet first with your Savage Claw, then Darkness next, to combat any healing. Again,hit that aqua pet with another Savage Claw and save the Nocturnal Strike for the flying pet he brings in next round. You are going to take damage from Whirlpool, but it's not enough to worry about. Bring in any 10th level or higher pet, as 3rd pet, to get xp. Legion introduced a slew of owls to bolster the preexisting Flying pets with Call Darkness and Nocturnal Strike. The Fledgling Warden Owl is the most difficult to acquire and (Appropriately) the most desirable for its P/P breed. 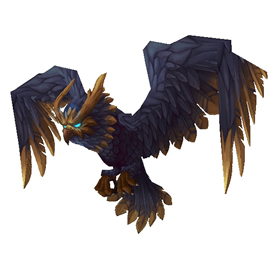 While not as versatile, this allows the Fledgling Warden Owl to act as a substitute to the Dread Hatchling, which became unavailable with the release of Legion. Even if you already have a S/S Crow, this pet is worth looking into.